Sherman has some interesting thoughts. Wilson as many baseball executives believe wants to play with the Yankees. There it is....Wilson or Darvish, Swisher or/and Beltran. Picture this lineup....Jeter, Granderson, Beltran, Cano, A-Rod, Teixeira, Montero, Martin and Gardner? In regards to Sabathia....as suggested, five years at $125 million with a makeable sixth-year option to get a deal done. Yankees will not go for 7 years. The Yankees must lean more left-handed in their pitching staff and be more diverse in their lineup. This is the starting point for their offseason. That is right after they take a deep breath to regain their equilibrium following a five-game Division Series loss to the Tigers. In the days under George Steinbrenner, the Yankees tended to make decisions with the raw pain of season-ending frustration still fresh. Heck, when the Yankees last lost to Detroit in the first round in 2006, The Boss wanted then-manager Joe Torre fired instantly. The Yankees remain championship-or-failure under Hal Steinbrenner. But the son tends to be more analytical than the father; less rash. So the Yankees will proceed in orderly fashion, which means getting general manager Brian Cashman re-signed (very likely) and then doing the same with CC Sabathia (also likely, but not as certain as Cashman’s return). And then the Yankees will continue to go about the impossible business of trying to make a team bulletproof from April through October. It can’t be done. Even with a $200 million payroll. There is just too much unpredictability. What if I had told you the Yankees would have the best Division Series ERA of any of the eight teams involved and not advance? You would have thought that was impossible. But that is what happened. The main culprit on the pitching staff was the one starter there was not supposed to be worries about, Sabathia, and the overall undermining element was an offense that was second in the majors in runs scored. Cashman is not the same person he was in 1998 when he took the job. He is colder, more willing to tell the hard truths about, for example, aging players, which has made him unpopular in the clubhouse and made him less joyful in the position. I sense, however, he wants to stay and ownership wants to keep him. There is an unrealistic view of what percentage of calls a general manager should get right. I think Boston’s Theo Epstein, for example, is an outstanding general manager. But he has a powerful mandate to win each year, influences above him that can — at times — dictate personnel decisions and the kind of money to throw around that when something does not work, it does not work on a grand scale. All of this can be said of Cashman, as well. But he has created an orderly way for the Yankees to make decisions and the results are, generally, better personnel decisions under Billy Eppler and better drafting under Damon Oppenheimer and better results, overall, in getting useful players to the majors. The Yankees are viewed as having one of the game’s stronger farm systems. That even in his walk year Cashman was trying to get his ownership not to spend on Rafael Soriano and Carl Crawford, or trade big prospects in midseason for Ubaldo Jimenez speaks to both a good thought process and integrity not to emphasize job security over doing the right thing. The Yankees business model and historic mandate means they have to begin every year believing they can win 95 games and a championship, and keep filling expensive seats. That is how they ended up going against proclamations and principles to re-sign Alex Rodriguez for a record $275 million, and going against their general manager’s advice to give $35 million to Soriano to be a setup man. Sabathia’s camp knows this, and it also knows the Yankees will be hard-pressed to see themselves as 95-win-plus championship material if their ace leaves. Because it is hard to see how they replace him. Within the Yankees’ baseball operations, C.J. Wilson is viewed as closer to a No. 3 starter than a No. 1. Yu Darvish might be an ace or he might be the second coming of Daisuke Matsuzaka. The trade market does not currently project as promising because Seattle has shown no inclination to move Felix Hernandez. So without Sabathia, the Yankees could be trying to win with Nos. 2-5 starters, but not a No. 1. Thus the Yankees will place a premium on retaining Sabathia. But he is going to, at the least, threaten to opt out unless the four years at $92 million left on his deal is not greatly improved. Sabathia probably will demand nothing less than the seven years at $146 million the Yankees offered Cliff Lee last offseason or maybe even insist the Yankees outdo his current seven-year, $161 million deal because they bettered A-Rod’s existing 10-year deal when he opted out. The Yankees might just blink again. Remember how significantly they outbid the field the last time they signed Sabathia because they needed him so badly. But I sense a resolve not to repeat the mistake of Rodriguez by doing the kind of long-term contract they know at the moment of inception will be debilitating down the line. One influential official pointed to the Red Sox going all-in last offseason with big moves for Crawford and Adrian Gonzalez, and then not even making the playoffs and probably doing significant long-term damage. The lesson is if you emphasize only the short term your team will, at minimum, be badly hurt in the big picture. So I expect the Yankees to try to sweeten Sabathia’s deal, but consider seven years a breaking point and maybe even six. To go where he wanted, Lee rejected the Yankees’ larger total dollars for a five-year, $120 million pact with the Phillies. The Yankees know Sabathia has moved full-time to New Jersey and loves it, and greatly appreciates being a Yankee. So maybe they better Lee’s deal by offering five years at $125 million with a makeable sixth-year option to get a deal done. Would another team propose more even after Sabathia’s weight gain and ineffectiveness late in the year? Probably. So it could come down to how much Sabathia really wants to stay. If Sabathia stays or goes, the Yankees have to think about adding more lefty pitching to their staff. They play home games at Yankee Stadium with its short right-field porch and consider the lefty-leaning Red Sox their main nemesis — and going through the year again with just one lefty starter and reliever is not enough. This is going to make Wilson attractive. He is a lefty and the best free-agent starter available, unless you believe in Darvish, who is a righty. Now there are Yankees officials who are very high on Darvish and think his stuff will translate here in the way that Matsuzaka’s didn’t completely. In addition, signing a Japanese free agent means no draft-pick compensation, and an added bonus for the Yankees is that any money spent to win the post to get exclusive negotiating rights with Darvish does not get counted toward the luxury tax. Texas, Toronto and Washington are expected to be aggressive on Darvish and the Yankees already have had buyer’s remorse on Hideki Irabu and Kei Igawa. So they are more likely to consider Wilson, who will be pursued by the same teams and more. Multiple executives spoken to, however, believe the gregarious Wilson wants to play in New York. But even if the Yankees can find a lefty starter in addition to Sabathia, they also need a second lefty to join Boone Logan in the pen. There will be several on the free-agent market and the best option for the Yankees is San Francisco’s Javier Lopez, who has held lefties to a .223 average in his career. From multiple conversations with Yankees insiders, I suspect the offense is going to return pretty much intact next year, except with Jorge Posada gone and Jesus Montero taking on a larger role as a catcher/designated hitter. To get his athleticism into the lineup, Eduardo Nunez will be asked to play more outfield in addition to short and third. Rodriguez has pledged to get lighter and more athletic and return to the land of 30 homers and 100 RBIs. The options for Robinson Cano and Nick Swisher will be picked up, and the Yankees will tender a contract to Russell Martin to play in his 2012 walk year. If this is what the team looks like, they would try to retain Andruw Jones, who they saw as an asset on the field as a lefty masher and in the clubhouse, where he became particularly tight with Derek Jeter. Jones liked being a Yankee, but he sounded as if he might get his knees cleaned up, lose some weight and make a run at being a full-time player again. Jones is still just 34, one day older than Beltran. There was a belief the Yankees’ postseason failure was because when they don’t hit homers, they don’t manufacture runs. And there is some truth to that. But I think there is another lack of diversification that has nothing to do with speed or bunting. When the Yankees won it all in 2009, they had three switch-hitters (Posada, Swisher and Mark Teixeira) who thrived from both sides of the plate plus a fourth (Melky Cabrera), who was similarly near league average from both sides. In 2011, Posada became almost exclusively used against righties because his right-handed swing became so putrid, and Swisher and Teixeira were much better against lefties than righties. Detroit used all righty starters and Posada hit well in the Division Series; Swisher and Teixeira were bad. Beltran was the lone switch-hitter this year (minimum 100 plate appearances as both a lefty and righty) to produce a .900 OPS from both sides of the plate. In addition — as opposed to Teixeira and Swisher — Beltran has been brilliant in the postseason. Once Posada was stripped of catching duties, he became a designated hitter only. The Yankees clearly want the position to be more flexible so, for example, an older position player could be installed there 25-30 times. Beltran does not want to DH full-time, but maybe he could do it for 40 games, and Girardi can find a way to rotate Beltran, Swisher and Brett Gardner around Curtis Granderson while still getting enough DH at-bats to use Montero, who the Yankees believe is ready now to be an offensive difference maker. Or else the Yankees must consider either picking up Swisher’s $10.25 million option and trying to trade him or not picking up the option and signing Beltran as Swisher’s right field replacement. Is there risk? You bet. Beltran played 142 games in 2011, but he has significant knee issues. With Scott Boras as Beltran’s agent, I suspect he gets no less than three years at $42 million, but there always has been a question about Beltran’s passion, especially when he is on a multi-year contract. But Beltran can handle New York and October and he is just flat-out a better hitter than Swisher. Don’t the Yankees at least have to consider a regular 2012 lineup that looks like this: Jeter, Granderson, Beltran, Cano, A-Rod, Teixeira, Montero, Martin and Gardner? So, I caught the thread early enough to be able to participate this year. Last year it was so long, I couldn't keep up. Hope you all don't mind - I spilt my vitriol in two threads yesterday, but I'm over it now. Now, it is the excitement of watching the off season moves. For anyone that doesn't recognize me, I am a died-in-the-wool Yankees fan living near Seattle (the Yankees westernmost farm team!). Originally from Arizona and transported to the Pac NW, I have been a Yankees fan since around the Kennedy era, back in time where life was in black and white. LOL. Even then, the Yankees had their Universe of fans. My major goal in life is to own one of those pinstriped Yankee cars, but I am out of area and that will always just be a dream. But, it is a good dream, imagining it driving down Edgar Martinez Boulevard. I love the chaos that is being a Yankee fan inside enemy territory, rather like Preislers antics among Boston, but much less in the news. My saddest story is that I was never able to make it to the old Yankee Stadium, although my daughter has and she and her husband got me pictures when driving by. My happiest story is that I am and will always be a Yankees fan. One last thing. I love that MLB had Boston chosen as the Winner Takes All this past season even before the season began and have revelled in the joy of seeing that prophesy unravel and turn to dust. I was so alarmed to hear they were taking on Murderer's Row, seeking to surpass that thrilling team's record. But, you've gotta love irony. The Good Lord has to be a Yankees Fan with a Tremendous Sense of Humor! I want to thank the Good Lord for making me a Yankees fan. October 9, 1958- Yankees hurler Bob Turley pitched 6 2/3 shutout innings in relief of New York starter Don Larsen to beat the Milwaukee Braves by the score of 6-2 for the 1958 World Series title. The New York Yankees became the 1st team since 1925 to win the World Series after being down to 3-1 games. Yankees 1B Bill Skowron’s 3-run HR helps the Yankees win the game in the 8th inning breaking a 2-2 game. Welcome ... glad to see you joining in. October 11, 1977- The Yankees defeat the Dodgers by the score of 4-3 in the opener of the 1977 World Series. The Dodgers held a 2-1 lead in the 6th inning, when the Yankees tie the game at 2-2 in the 8th inning on a Willie Randolph HR, followed a Thurman Munson double later in the inning that score the go head run. The Dodgers tied the game at 3-3 in the 9th inning, sending the game into extra innings. In the 12th inning, the Yankees score the winning runs, with Willie Randolph on 2B after hitting a lead off double, Thurman Munson was intentionally passed, and Paul Blair singles home the winning run. It is the Yankees first World Series game victory since Game #6 in 1964. The weekend has come and gone, the ALCS has started, and it seems time for the Yankees to move on. It’s rare that a team makes too much noise before the end of the World Series, but the Yankees will at least begin the process of moving forward when Joe Girardi holds his end-of-the-season press conference tomorrow. Girardi has already received a vote of confidence from his general manager. If the Yankees are going to make any real news this week, it’s likely to include Cashman himself. His contract doesn’t expire until the end of the month, but Buster Olney has already reported that Cashman and the Yankees are working toward a new deal that could be finalized before the end of the week. 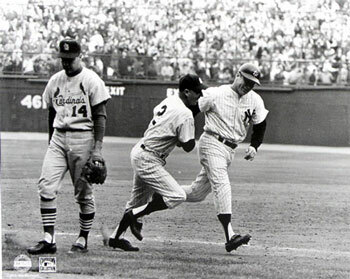 October 10, 1964- The Yankees starter Jim Bouton and Curt Simmons of the St. Louis Cardinals battle to a 1-1 tie through 8 innings in Game 3 of the 1964 World Series. Mickey Mantle hits a Home Run on Cardinals reliever Barney Schultz's 1st pitch in the 9th inning the Yankees win the game by a score of 2-1. It is Mickey’s 16th World Series HR breaking Babe Ruth’s record. Before his at bat in the 9th inning, Mickey tells his Yankees teammate, Elston Howard that he’ll hit Schultz’s 1st pitch for a HR. Mickey Mantle will finish the 1964 World Series with a .333 BA with 3 HRs, he will finish his MLB career with 18 HRs in World Series play for the New York Yankees. I'm following the playoffs also ... Yankees are my preference, but I'm a baseball nut also ... so I watch untilt he bitter end!